The region of Alsace is a narrow stretch of vineyards running north-south at the base of and nestled into the eastern foothills of the Vosges mountains. These, along with the Rhine just to the east of the vignoble, provide the region with an impressively favourable climate for such a northerly latitude. Sunshine hours are high during the growing season and rainfall low. The vineyard area stretches from just west of Strasbourg in the north to Mulhouse in the south, with the heart of the region centred around the town of Colmar. This is where the greatest concentration of top villages and vineyard inevitably on the slopes of the Vosges, with well-drained, meagre soils. By contrast those vineyards planted on the fertile, heavy alluvial soils on the plains towards the Rhine are far less propitious for quality wine production. The generic appellation of the region is simply Alsace AC. The vast majority of wine is labelled by its grape variety. There is an ongoing debate in the region about the importance of the varieties themselves, as opposed to site and terroir, in determining style. There is just one permitted red grape, Pinot Noir, which can be good but is often light and insubstantial, needing a good vintage. The white varietals are the fairly neutral Pinot Blanc and Sylvaner (although there are some impressive old-vine examples) and the more aromatic Riesling, Muscat, Tokay Pinot Gris and Gewürztraminer. There is some Chasselas producing the odd varietal wine, as well as Auxerrois, but both will generally be used with Sylvaner and Pinot Blanc in generic blends. These are covered by the Alsace AC and are labelled either Edelzwicker or Gentil. An unusual rarity in the higher reaches of the Bas Rhin is the Klevner de Heilegenstein. No wines of real note have been produced from it. Confusingly, Auxerrois is often referred to as Klevner. The 50 grands crus here were established in 1983. 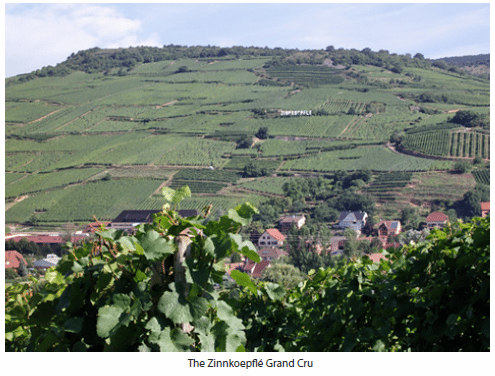 Wines produced from these are classified Alsace Grand Cru AC. The majority of these sites can be found in the heart of the Haut Rhin and were created to pinpoint the best vineyards. Much work still needs to be done with the region’s labelling system and although there is talk of it, there is no further official classification. Many wines make reference to their lieux-dits in order to emphasise potential quality. A number of these sites produce wines that are comfortably a match for many grands crus. The vineyards of the latter must be planted to Gewürztraminer, Muscat, Riesling or Tokay Pinot Gris. Almost all wines are varietal but there are experiments, particularly those by Jean-Michel Deiss, in establishing field blends. Some of the region’s greatest wines are the late-harvested wines, Vendange Tardive (VT) and Sélection de Grains Nobles (SGN). Being made from late-harvested grapes, these are generally sweet styles. Noble rot may occur, particularly in the SGNs, but not always. However, the classification is based on grape ripeness at harvest and some Vendange Tardive wines can be surprisingly dry. Indeed the whole question of levels of residual sugar can be confusing. Some producers tend towards a very steely, dry style, while others prefer to let nature take its course, with fermentation stopping naturally. The results in the latter case are wines with often surprising levels of sugar and extract. The best, though, are very well balanced with sometimes remarkable depth. In order to help with this confusion a scale has been established, indicating on the back label the degree of sweetness. The final style is Crémant d’Alsace AC. These are made by the traditional method and are mostly produced from Pinot Blanc and Riesling, although Auxerrois, Pinot Noir and Tokay Pinot Gris are also permitted. The best examples have reasonable depth and structure, often with marked acidity.